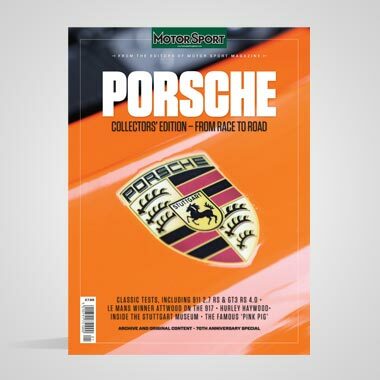 When Ayrton Senna takes pole position, leads the race from start to finish, to win at a new record speed, there are those members of the British press who yawn and say: "Not much of a race". I am happy to say I am not one of those and I get enormous satisfaction out of watching an artist of high speed driving doing a fine job of work; the fact that there are few drivers who can challenge Ayrton Senna, and few cars that can match the McLaren-Honda V10 is unfortunate from the racing point of view, but does not detract from the joy of watching a master driver in real action. It is probably not very spectacular on the television screen or if you are standing in the pit lane, but standing at the bottom of the hill from La Source hairpin down to the Eau Rouge bridge watching the approach at 170 mph, the flick of left lock and right lock as the car tackles the steep Raidillon climbing up to the sky, is to see something special; and that is only one small part of the spectacular Francorchamps circuit, there are many more in the 6.940 kilometers (4.312 miles) that make up the lap. 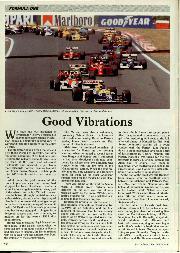 The painfully anti-Senna magazine Autosport excelled itself in its report of the race, quoting in a headline "Senna dodges the wreckage to win Belgian GP". They were referring to accidents that caused the race to be stopped twice with red flags. The truth of the matter was that Senna did not dodge any wreckage at all, and did not even see any, because it all happened way behind him. 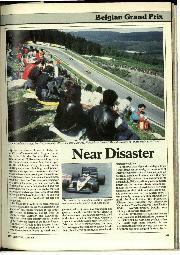 A lot of the tail-enders towards the back of the grid did indeed 'dodge the wreckage' but not Senna. Apart from Senna's natural aptitude to be the fastest in qualifying, on the simple premise that if pole position is there for the taking, why not take it, it also means there is less chance of getting involved in other drivers' accidents away from the start. 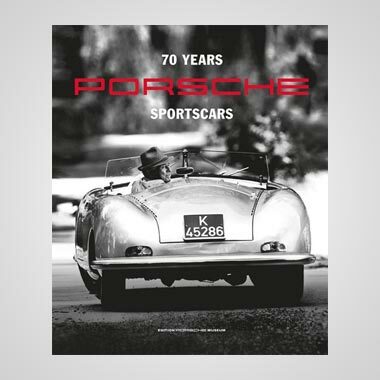 The Francorchamps circuit is one of those made up from public roads closed for the occasion of the Grand Prix, but in no way is it a temporary affair. Everything is permanent and to the highest standards of Formula One requirements and you can drive round the circuit before it all begins to happen and again after it's all over, so that it is a circuit where you can virtually 'live' with a driver as you watch him circulating, especially if you've had the opportunity to listen to a top driver describing a lap of the circuit. Even the man on the back of the grid can bring it all alive for you. For me the visit to Francorchamps is one of the highlights of the Grand Prix season. There are no opportunities for anyone to do any testing before the event, so that it is the same for everyone when practice begins on Friday morning, though naturally drivers and teams that have raced in previous years and collated and analysed all their previous data correctly have an obvious advantage. Both Honda and Renault were fielding 'improved' versions of their V10 engines, though not a lot was given away, but power and sustained torque were the obvious requirements, probably with higher rpm. Renault described their engine as 'Evolution 2' of the RS2 and mentioned that enhanced performance was coming from new connecting rod and camshaft development, which could suggest carbonfibre composite strengthening and lightening of the con-rods as Mercedes-Benz are using in their sports car V8 racing engines. Honda merely described their engines as 'Version 5' particularly suited to the requirements of the Belgian circuit, which means more power at the top end and higher rpm. It was noticeable that the Honda engines were using plastic intake trumpets in place of the regular highly polished aluminium ones, and they were still of staggeringly large diameter for a 10 cylinder engine. The Honda engineers and mechanics make it quite clear that they do not want anyone looking down the inlet trumpets and as soon as the airbox is removed plastic covers are put over the inlets. Until now the RA100E Honda engine has been using butterfly throttle valves, whereas most other engines use sliding plate throttle valves, but this time it looked as though the Japanese engine was using a sophisticated sliding plate system. First day's practice saw perfect weather conditions, perhaps a little too perfect for racing engines and a bit too hot, but nonetheless the scene was set for a hard fought McLaren v Ferrari battle, with Benetton and Williams not far behind and Leyton House well up for a nice change. Down at the back there were some changes in as much as the Onyx-Monteverdi team had withdrawn and this allowed the two Ligiers to move up from the early morning pre-qualifying into the real thing, and gave hope to two different rabbits; in this case the AGS cars of Tarquini and Dalmas. The Friday order at the front was Berger, Prost, Senna, Mansell, Piquet, Boutsen as good a bunch of high-speed runners as anyone could wish for. Just after half way through Saturday qualifying there was a tense moment as Piquet's Benetton spun coming out of the last corner and hit the end of the pit guard-rails; the driver was alright, but everything had to be stopped while wreckage was gathered up. The top runners were finding that the Goodyear qualifying tyres were marginal for one complete lap at maximum effort, the very fast downhill corners playing havoc with the front tyres particularly. For a really fast lap the drivers had to strike a balance between going very fast on the first half lap and losing a certain amount of adhesion on the second part, or going not so fast on the first part and giving it all on the second part, or yet again they could strike a compromise all the way round, but none of it was easy and the hard-chargers at the front of the grid were having to work really hard. Piquet was taking a gamble on giving it his all at the end of the lap, but the tyres had gone over their peak and he lost it on the final corner. 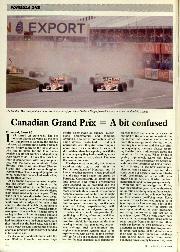 A break in the middle of the qualifying hour often puts a damper on things when they restart and somehow the frenetic tempo is lost, but this time it did not happen and the battle for grid positions continued to the bitter end, and it was Senna's advantage to be on pole position. In the drivers briefing before the race the Director of the event made it quite clear that if there was any sort of accident at the start, going into the first hairpin, he was not going to stop the race, always providing there was no personal injury. In spite of his warning there was an accident at the start, in fact there were three, but Senna, Berger, Prost and Boutsen were long gone. Imagine their surprise when red flags came out before the end of the opening lap and the race was stopped. Suzuki (Lola-Lamborghini), Piquet (Benetton) and Mansell (Ferrari) had had a shunting match, the Brummie being totally innocent but the Ferrari was badly bent. In the general dodging about, Donnelly and Warwick collided, wrecking the Ulsterman's car and giving Warwick a punctured right-rear tyre, and nothing to do with the accident, Larini's Ligier broke a final drive. Nobody was hurt in this low-speed caramboulage, but Warwick was driving slowly round on a flat tyre, and two more cars had spun off at the ess-bend at Les Combes, so the Race Director had little option but to stop the race. Twenty-five minutes later all was ready for another start, Mansell was in the spare Ferrari, which did not suit him as it was set up for Prost, Larini was in the spare Ligier, Warwick took the spare Lotus and Donnelly was hoping to take Warwick's car after it had been repaired. Suzuki was out of the race as he had crashed his race car in the morning warm up and was in the spare car at the first start anyway, so that was that. As the tail enders breasted the top of the Raidillon Paolo BariIla let his Minardi slip from his grasp and had a monumental high-speed spin into the unforgiving guardrails, wiping off most of the appendages from the car. At first sight it looked very bad, and doctors and service vehicles were soon on the spot. As this was just over the brow the Race Director once again was forced to call for red flags and the race was stopped. 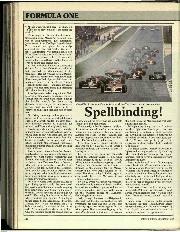 Once more the leaders stopped at the grid at the end of the lap, and once more Senna did not 'dodge the wreckage' he did not even see it, so that one wonders where the Autosport headline writer was. Thanks to modern carbonfibre composite construction BariIla was extracted from the Minardi monocoque virtually unhurt but he could take no further part in the Belgian Grand Prix, which was now about to make a third start. For the third time Senna led the field round on the parade lap, now reduced to 23 cars. 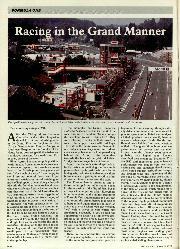 Suzuki and BariIla were non-starters and Donnelly was going to start from the pit lane in Warwick's repaired car. The initial start had been given at 2pm and this third and final one was given at 2.56pm, the 'almighty' television being in something of a turmoil running nearly an hour late, but the Belgian Grand Prix and the well-being of the drivers are much more important than time schedules and money. This time all went well and as the last car went by the pit exit Donnelly joined in, so we had 24 cars in the race. The two McLarens made no mistakes and led from Prost, Boutsen and Patrese, with Nannini, Piquet (in the spare Benetton), Mansell, Alesi, CapeIli and Bernard. Mansell was right off the pace, the spare Ferrari being down on power and feeling 'undriveable' according to the driver later, even though Prost had set it up for his own emergency use. Naturally everyone had been a bit anxious about their clutches with three starts in succession, but all was well and it was now a question of keeping an eye on the tyres. Most teams had decided to leave the decision to the driver on whether to try and go through non-stop or make a stop for new tyres, for nobody was going to know better than the driver about the tyre wear as it developed. The normal course of events meant that lap times were about 5 seconds up on qualifying laps, but the pace was still fast and the dry conditions encouraged some pretty frantic racing. 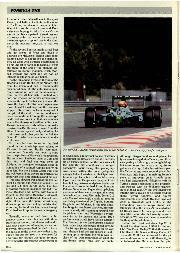 The opening laps saw Senna setting the pace, going fast enough but not overfast so that tyre wear became a problem, but it did not take many laps to see that Berger was trying a bit too hard holding on to second place, but he was forced to do so as he had Prost, Boutsen, Patrese, Nannini and Piquet close up behind and none of them were dragging their feet. After a brief gap came Alesi in the Tyrrell 019 with Mansell seemingly unable to keep up and being threatened by CapeIli, Bernard, Gugelmin and Modena. In the first Lotus-Lamborghini was Derek Warwick, his teammate Donnelly still making up ground from his pit-lane start, and Warwick's performance (or to be precise, the Lotus 102's performance) would have looked alright if Eric Bernard in the Lamborghini-powered Lola hadn't been a long way ahead already! By 10 laps Senna was away on his own and already had the tail-enders in sight, coming up to lap them. 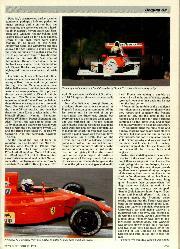 He really was in a class of his own regardless of what the anti-Senna press may say or write. Although Berger held second place, his tyres were losing their efficiency and Prost was getting a little angry at being held up, but more angry that it was letting Senna get away. On lap 14 the Ferrari thrust past the McLaren and took second place, but there was little hope of matching Senna's pace, or improving on it. Already some cars had disappeared, Nakajima with his Tyrrell's engine reluctant to run properly, and Patrese with his Williams gearbox stuck in third gear. On lap 19 Mansell was into the pits to give up as he considered the spare Ferrari hopeless, and almost immediately afterwards Boutsen was out when a driveshaft joint broke, so the demanding Francorchamps circuit was taking its toll of the weak. At the end of lap 18 Berger was in for new tyres and three laps later Senna decided new tyres were necessary. We now saw the most remarkable thing of the whole race. If you believe some of the anti-Honda-McLaren writings you would wonder why he was bothered, for they tell us that the Senna/McLaren supremacy is purely a matter of Honda horsepower and McLaren top speed, so therefore Senna should be able to waft past the Benetton with ease. 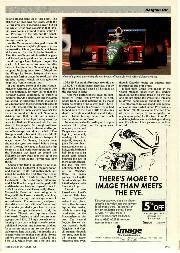 If you talk intelligently to Senna he will explain that he knew exactly how fast the Benetton could go, how well Nannini is driving, and that he did not consider spending one or two laps finding a way by were justified; not if he could win the race down to the hairpins. All thoughts of Prost and his tyre stop were irrelevant and he got out of his hairpin and down the hill to Eau Rouge ahead of Nannini who was full tilt down the hill from La Source hairpin. It wasn't over for Senna, because even though the tyres are heated before being put on the car, they need at least half a lap to get up to full working temperature, and the Benetton was hard up behind the McLaren as they went over the top of the Raidillon, Prost in the Ferrari was now third. Senna's first flying lap after his pit stop was in 1.57.5, his fastest in the race so far, and Nannini could not match that, nor could he match the next five that Senna did. 1.56.9; 1.56.1; 1.56.1; 1.55.9; 1.55.9. He then did 1.56.6 as he lapped Alboreto, and 1.57.0 as he caught and lapped Caffi and then he was back into laps at 1.55.7 to 1.55.1 for six laps and it was really all over. Meanwhile, Prost had been doing heroic things with the Ferrari, virtually matching Senna lap for lap, but always about 1 second slower. 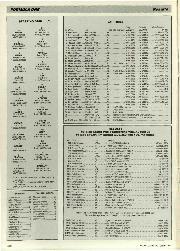 For consistency and precision drivers of the calibre of Senna and Prost make you shake your head in disbelief when you get a chance to study the Longines Olivetti race lap time sheets afterwards. 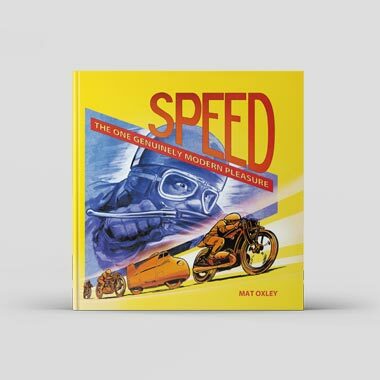 Bearing in mind they are averaging around 134/135 mph on such a challenging circuit with its high-speed corners, uphill and downhill and maximum braking for a hairpin once a lap, to see electronically timed laps with only hundredths of a second variation makes you blink. 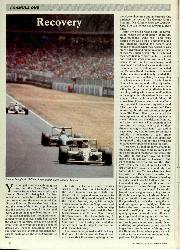 Senna did two consecutive laps of 1.55.143 and 1.55.132, while Prost did 1.56.162 and 1.56.115. Eventually Prost got in one lap at 1.55.087 to claim fastest race lap, but by this time Senna had eased off his pace as the end was in sight. These two perfectionists gave an exhibition of Grand Prix driving at its best, apart from a slight abberation by Prost when he couldn't find a way past Alboreto's Arrows and Caffi's Arrows. Senna had lapped both of them with little trouble, his depth perception and high-speed judgement always having been that much sharper than that of Prost. Almost overlooked was Piquet's drive into fifth place and Gugelmin's arrival in sixth place, both still on the same lap as the leader, which is something worthwhile on the Francorchamps circuit. The second Leyton House car was seventh, both Gugelmin and Capelli running through non-stop, their Judd V8 engines never missing a beat, even though Capelli's broke an exhaust pipe towards the end of the race.